Art is an incredibly diverse subject, found in painting, music, writing and more. One lesser known art form is that of the living wall, a vertical garden tailor-made to be a practical piece of art. These living walls, most commonly known as green walls, are planted with a diverse set of plants in a specific configuration to become a beautiful and unique piece of art. Unlike a vertical garden or lawn, these living pieces of art can vary in growth, color and flower to create a completely organic and visually appealing design. They can be found in larger art galleries, and have been designed by esteemed artists for important buildings around the world. Their popularity has been growing in the Northwest and Western United States, as well as within the Southwest region, where succulents are most commonly used due to their longevity and resourcefulness concerning water. While each climate zone requires its own variety of plants, the planting process is for the most part the same in most cases. The plants are grown in soil within bags or blocks that are then installed onto the wall with a simple screen and watering system to keep them upright and sustainable. When done well, interior walls can last for over five years without needing much maintenance or replacement. Living walls serve an important practical purpose. Their main use in urban areas is to reduce the overall temperature in buildings—they serve as external insulation that absorbs solar radiation to keep buildings at, and even cooler than, the ambient temperature. Everyone knows that plants remove carbon dioxide and produce oxygen naturally, though not as many are aware that they also filter and clean pollutants already found in the air. In a country where a reported 80-90% of people spend a significant period of the day inside, an interior and even exterior living wall can help absorb and clean commonly found pollutants. Sick building syndrome, which refers to toxic fumes that are found to be released from the furniture, the décor and even the materials within a building, is considered a significant health issue of modern times that can be solved by living walls. Adding office plants is already a common practice to improve air quality, a purpose that the living wall serves to a much more significant degree. 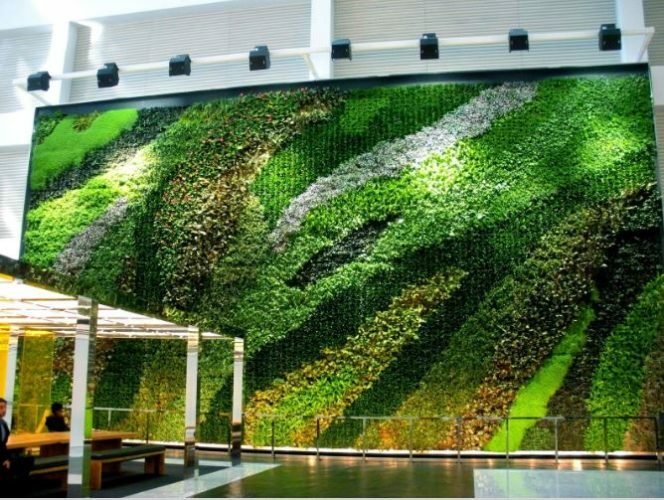 Living walls can be increasingly found in urban areas due to the often abundance of vertical surface area on large buildings, though their popularity in homes and other domestic settings is steadily rising due to their practicality beyond their visual appeal. Studies have shown that being close to nature can significantly increase a person’s wellbeing. Nature in the home has been shown to be calming and to increase comfort levels, and nature in the job can noticeably increase job satisfaction. 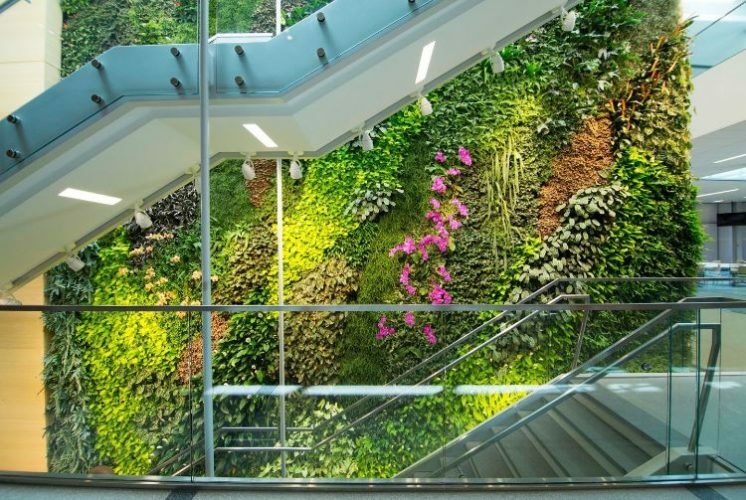 A cutting edge structure such as a green wall shows that one is committed to their employees’ or family’s wellbeing, as well as to contributing to a healthier environment.